You Wanna be Popular – and Comfy? You’ve just moved into a new neighborhood. Rumors are circulating about Sam and Suzy Socialite down the street that throw raging block parties, complete with late night barbecues and mingling. Your anxiety is reaching an all-time high. How can you compete with such magnificent neighboring skills? You’ve got to come up with something fast. It is still early in the season, perhaps a bit brisk to host outdoor soirees. What if you could get a jump on the cocky neighborhood socialites by staging an early block party thanks to your patio heater from Warmzone. It will be a celebration of the summer to come, but you do it when spring is still fresh in the air and the crisp night air keeps most people hunkered down for a few months. Yep, the neighbors’ collective jaw just dropped as they opened your invitation to your spring fling. Suddenly thanks to your patio heater your popularity with the new neighbors is soaring. Your patio heater is the talk of the block, the must see item of all the families within eyesight. A patio heater means that you can get a jump on summer barbecues and make it comfortable for your guests to stay outside as the stars twinkle overhead. The patio heater will kick out soothing warmth as you mingle as the King of Bunker Lane, circulating with smiles and warm food. Your guests smile and sink into a relaxing evening they will never forget. Then they will eventually retire to their own beds and talk about just how cool you are and wonder why Mr. and Mrs. Socialite didn’t think of a patio heater before now. A snow shovel competing with an automatic snow melting system is like pitting a fly against a wind machine. The automatic snow melting system has proven snow melting capability on its side and the snow shovel, well, it just offers a lot of grief and aches and pains. When keeping score, the snow melting system wins every time. Snow doesn’t stand a chance against the advanced radiant heat cable technology. Snow melting systems are becoming more and more widespread because those keeping score at home can see clearly for themselves that heated driveways are winning the war on snow every time it falls from the sky. The radiant heated driveway is a smart driveway. The snow melting cables radiate consistent warmth beneath the surface of your driveway to provide a snow-free environment every time. The snow still falls, we haven’t figured out a way around that yet, but it doesn’t stick on a warm surface. It quickly turns to water and evaporates on the next dry day with some sun. Snow doesn’t have a chance to accumulate because the minute it begins to fall the snow melting cables kick into gear thanks to the automatic sensors included in the radiant snowmelt systems. Chances are the automatic snow melting system is going to keep on winning, so you better get on the right team. For years baseboard heating has been the home heating system of choice for many consumers. Relatively cheap and easy to install, baseboard heating systems were installed in new homes in the 70s, and without knowing their other options, consumers have stuck with it—until now. Radiant heated floors are quickly trumping baseboard heating as the titan of the home heating market. With its superior heating capabilities and maintenance-free logistics, radiant heating is persuading consumers everywhere to make the switch from baseboard heating to radiant heating. By taking a look at how the two different systems work and their pros and cons, you’ll quickly see that saying goodbye to baseboard heating is the best decision you’ll ever make as a homeowner. While both baseboard heating systems and electric radiant heating systems use similar concepts, they are certainly not created equal. Efficiency: Baseboard heaters aren’t exactly known for their efficiency. Heating a whole room with a baseboard heater can take quite a while, so you have to plan ahead if you want the room to be warm when you’re home. Because they take so long to heat up, baseboard heaters can quickly rack up your electricity bill. Because electric radiant floor heating heats the floor and the objects around it, it takes half the time to heat up a room. Radiant floor heating is 100 percent effective, even at 50 percent capacity. Additionally, 100 percent of energy consumed by your radiant heating system is used to heat the room. Installation: Baseboard heaters are relatively easy to install, but you have to waste a large amount of wall space to do it. What’s more, baseboard heaters are quite unsightly and noisy, and they must be strategically placed as to not conflict with furniture placement. While heated floors require a little more elbow grease to install, it’s not difficult. Any motivated do-it-yourselfer can install heated floors. Additionally, radiant heated floors require no wall space, and you don’t have to worry about an unsightly heater sticking out of your wall. After all, what’s a warm room if it’s an ugly room? Maintenance: Baseboard heaters use heat coils that need to be frequently vacuumed. Dust on the coils reduces the effectiveness and efficiency of the heater, taxing your heating bill and reducing the lifespan of the system in general. What’s more, a dirty heater makes your house smell like burnt dust—not the most pleasant smell in the morning. Radiant heated floors require absolutely no maintenance. It’s as simple as that. There are no moving parts or coils to clean, and with the high-quality heat cable and thermostat, you can count on your floors to provide warmth for years to come. Safety: Consumers with baseboard heating systems must take great care to keep furniture and other objects away from the heater. This not only interferes with design decisions, but also presents a serious safety hazard. A home in Colorado was destroyed after two suitcases leaning against a baseboard heater ignited, causing $50,000 in damages. Radiant floor heating is guaranteed to be safe. The heating cable used is safely insulated and uses no high voltage, no combustible gases, and doesn’t create any hot surfaces. Radiant heated floors certainly beat baseboard heaters in several aspects, but perhaps the crowning feature of heated floors is the maximum flexibility they offer consumers. 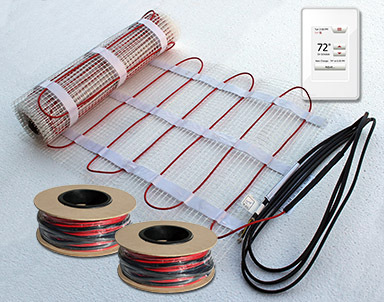 Electric radiant heating offers three main aspects of flexibility that baseboard heating systems don’t: installation freedom, variety, and custom design plans. 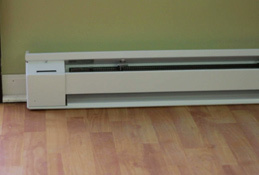 Baseboard heaters can usually be installed in any room, whether the house is old or new. Finding the wall space, however, can be a tricky task. Additionally, having to rearrange your room to accommodate a baseboard heater is far from convenient. Radiant heated floors, on the other hand, can go in any room on any surface. Whether you’re building a brand new home or sprucing up an old one, you can experience the benefits of radiant floor heating. Plus, you’ll never have to worry about keeping your furniture away from a dangerous heater. Feel free to place that fabulous new sofa wherever you see fit. Additionally, heated floors can be installed on virtually any surface you can think of. Install one in your carpeted living room, your hardwood dining room, your tiled bathroom, or all of the above. When it comes to choosing a baseboard heater, there aren’t that many options to choose from. All baseboard heaters are essentially the same poor quality mechanism that leave much to be desired. With a Warmzone radiant heated floor system, however, you have a slew of high-quality products to choose from. Whether you choose ComfortTile heating mats, In-Slab heat cables, HeatShield panels, or FoilHeat, you’re sure to be satisfied with your heated floors for years to come. Perhaps the greatest part about switching to radiant heated floors is the unparalleled service from Warmzone. When you are ready to make the switch from baseboard heating to electric radiant heated floors, the friendly Warmzone staff will walk you through the whole process from start to finish. 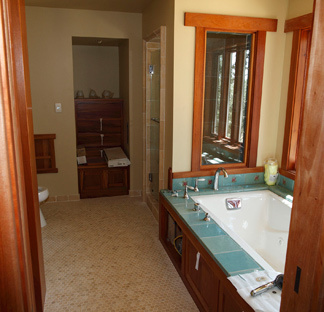 We’ll design a radiant heat system tailored to your specific needs. We realize your needs aren’t the same as the next customer’s, and we’ll design a customized plan of action (complete with CADs) to make sure that your radiant heated floors not only meet but exceed your expectations. When it comes down to it, there’s just no reason to continue to wallow in your baseboard heating blues. Radiant heated floors offer superior efficiency, quality, and convenience that baseboard heaters couldn’t even think of touching. Say no to noisy, unsightly heaters and yes to cozy, consistent heated floors that will keep you, your family, and your wallet happy all winter long. Of the components mentioned above, the heating element and the controller distinguish hydronic heated driveway systems from electric heated driveway systems. The heating element for a hydronic system, as you may have guessed, involves water. 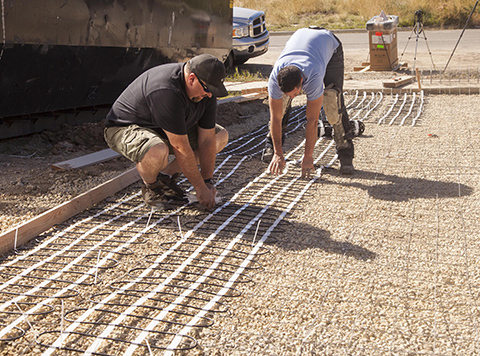 Specifically, hydronic heated driveways use what is known as closed-loop tubing to heat the surface of the driveway. The tubing is generally made of a flexible (and quite durable) polymer or synthetic rubber to circulate a mixture of hot water and propylene glycol (antifreeze). The fluid is warmed to temperatures between 140 to 180 degrees F to deliver enough heat for snow melting. A water heater or a boiler is the chief source of heat for a hydronic heated system, which can be powered by any energy source that satisfies the btu requirements, including natural gas, electricity, oil, wood, or even solar collectors. A circulating pump and supply and return manifolds, installed in an easily accessible location, transfer the water between the heat source and tubing. Unlike hydronic systems, electric heated driveway systems use hot wires to heat paved surfaces. These wires are surrounded by layers of insulation, copper grounding braid and a protective outer layer of PVC or polyolefin to form a flexible cable about ⅛ to ¼ inch in diameter. What’s great about the heat cable is the flexibility of the application. Cable is available on spools as well as pre-woven into mats, and can be customized (cut) to suit virtually any type of layout, including driveways, ramps, common walkways and sidewalks. After being triggered by the snow sensor, the control unit then powers the heat cable to warm the driveway. To reduce the power demands (and operating costs), you can install cables in just the tire tracks of a driveway rather than the entire area. Warmzone offers several options and provides complete system design services to ensure that you receive the best system layout and products for your project. Flow or current: What’s your Chi? At this point you may have already drawn some conclusions about these systems. Here’s an “at-a-glance” comparison of both systems. 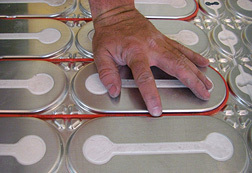 Flexible power source options can lower operating costs. Only one power source. Circuit breakers may have to be updated to accommodate system. Installation costs may be higher, especially if water heater or boiler is required. Easier installation. Also can be used in retrofit applications. Higher maintenance. Propylene glycol fluid levels must be routinely checked. Low maintenance. Less moving parts and no fluid levels to check! Requires heating of the water, resulting in a slower response time. Less warm-up time is required so the system response is faster. system depends on proper tubing spacing and layout. Tubes are usually laid out in a spiral or serpentine pattern for even heat distribution, making initial installation a bit more challenging than that posed by electric heated systems. Warmzone’s expertise with hydronic heat systems is an invaluable resource, particularly if you choose to go with a hydronic heated driveway. However, with the complexity of hydronic heat installation comes a large price tag, especially if a hot water heater or boiler is required. Electric heated driveway system in concrete. ClearZone electric heated driveway systems are generally more efficient than hydronic systems. Electric cables heat up instantaneously, whereas water within hydronic cables must be heated up before the snow begins to melt. Installation of electric systems is fairly simple for the “do-it-yourselfer”, and heat cable is also available pre-spaced and woven into mats, which can be easily rolled out to heat tire tracks or an entire driveway. This flexibility is invaluable in retrofit applications, where hydronic system installation is more evasive, and as you would imagine, costly. Hydronic systems may offer a lower operating cost than electric systems because they can run using the cheapest power source, such as natural gas, coal, propane, etc. 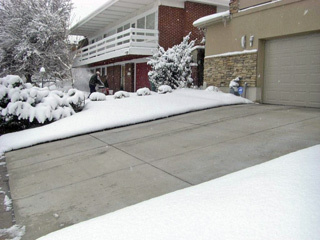 Hydronic snow melting systems are a reliable means for heating driveways and parking areas, but the “current” trend seems to be swinging to electric radiant heated driveways. The systems are easy to install, heat instantaneously and there is no maintenance or upkeep required to assure top performance. Installation options are numerous, whether you choose to heat your entire driveway, or roll out heating cable tracks to heat just where your tires hit pavement. Warmzone’s ClearZone heating cables are built specifically for heating driveways, sidewalks and other common areas to melt snow and ice in the worst of conditions. Extremely efficient and virtually maintenance free, they have become the Warmzone customer’s method of choice for snow melting. Warmzone has a variety of products and the expertise to install or retrofit your existing driveway with a realistic electric radiant heated driveway solution that’s equally energy efficient and cost effective, so you can put down your shovel, for good!